Dr. James Hurley, president of Tusculum, announced today that Chick-fil-A will be coming to Tusculum’s Greeneville campus in July of this year. The announcement was made on Friday at an open forum attended by more than 250 people, including a large number of students who applauded enthusiastically at the announcement. The Chick-fil-A will be a full-service restaurant and will be open to the community, said Dr. Hurley. The announcement came as part of an overall change in Tusculum’s food service partnerships. Dr. Hurley also announced that beginning in July, the new food service provided for the Greeneville campus will be Chartwells dining services. It is this new partnership with Chartwells that enabled the opening of the Chick-fil-A on campus. 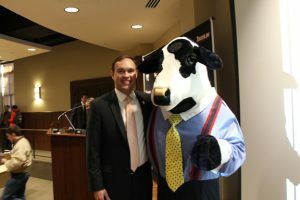 Representatives from both Chartwells and Chick-fil-A participated in the announcement that also included a visit from the Chick-fil-A cow.